Our first tool, designed to make fast Style Transfer accessible in After Effects. We use machine learning algorithms that learn how to create visual-friendly patterns that we call a Style. As a user, you can load this Style pack in After Effects through our handy plugin. Go to our online Styles Gallery to download new styles to work with Transfusion Styles. We currently offer 30+ pre-trained styles and we are continuously releasing new ones. With Transfusion Blend, an arbitrary style transfer algorithm, you can use another layer as the style input. Playing with this input layer will give you a lot of control over your custom style ! Output will be watermarked by a red cross. Limited to 100 frames per After Effects session. Once a valid license is entered these limitations are removed. 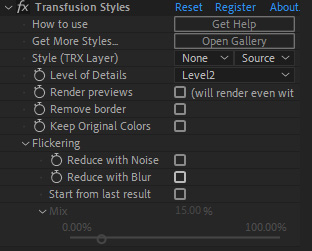 - Our plugins can now be found in After Effects under the “Transfusion.AI” category, instead of the “Style Transfer” category. New option to reduce flickering and improve frame-to-frame consistency: "Start from last result". When activated, this feature uses the last rendered frame as the input frame, resulting in a much smoother output when working with video. Both plugins are now available on Mac and Windows! 1. Reduce with noise: will add a static noise pattern over your image before processing, helping the algorithm to find similar features in each frame. 2. Reduce with blur: will blur your input before processing, getting rid of noise&grain that can cause flickering. 1. "Better resize" option has been removed, resizing now happens in a flash so it's always in high quality. 2. The plugin is at least half a second faster because of that. Not a huge speed difference on the processing of 1 frame but this will save time over the length of a video.